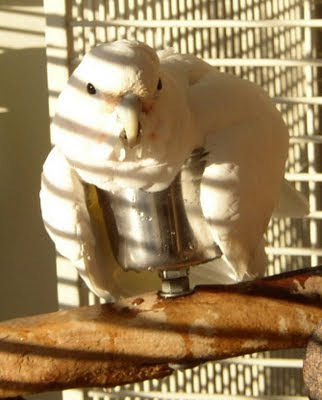 The Zen Parrot: Of Parrots, Politics, and Coffee: Our Flock: Our Goffin's Cockatoo: Kid Kadra: Acrobat and Showoff! 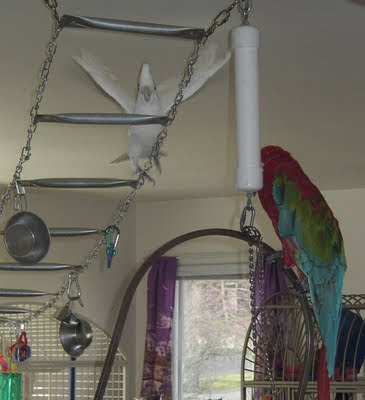 Our Flock: Our Goffin's Cockatoo: Kid Kadra: Acrobat and Showoff! Hatched in 1994, one of a clutch of three, Kid Kadra is a fifteen year old DNA sexed male Goffin's Cockatoo (Cacatua goffini), with the typical Too attitude! Kid Kadra was raised by his original owner, Martin Maurer, a personal friend, who considered Kid Kadra more like a service animal, carrying him on his shoulder virtually wherever he went. We once saw Martin parked at a gas station, pumping gas, with Kid Kadra sitting on his shoulder! Kid Kadra joined our flock in 2005 under the most unfortunate circumstances, with the untimely death of his owner, who had a history of serious illness. Apparently traumatized by the sudden death of his original owner, Kid Kadra was comatose for about two weeks, barely eating, let alone moving. Eventually Kid Kadra survived and adjusted to his new life with The Ballard Rain Forest. His Too personality slowly flowered and showed his true talents. For obvious reasons, Martin had kept Kid Kadra's wings clipped, but we allowed Kid to grow his flight feathers out. We keep all of our flock flighted. Slowly but surely Kid Kadra realized his talent for flying. Starting with short hops from cage to playstand, Kid started flying across rooms, then around rooms, then from room to room. Eventually he discoved this rain forest has a basement, so he even started flying from floor to floor! Kid Kadra showing off for our Greenwing Macaw and Diva parrot Roxanne! Kid Kadra chose our first Congo African grey parrot Corky to focus his attention on, and quickly became Corky's nemesis. Corky flew like a lead balloon, so was forced to chase Kid Kadra around on the floor. Kid would simply hop out of Corky's way, surely aggravating him! As his flying skills improved, Kid Kadra turned his attention to the macaws, not in the least scared off by their size. For whatever reason, Kid became infatuated with our Greenwing macaw Roxanne, but he found the tails of the other macaws irresistible. Kid Kadra harasses our male Blue and Gold macaw Aboo to no end, but wisely avoids our Alpha parrot, Miss Bubba Boy. Kid Kadra loves to fly, and is a true acrobat. Kid can fly circles around our other parrots, and knows that he can. Therefore, he does! As mentioned above, he flies from floor to floor. Only our newest parrot, our Timneh African grey Tillie, does that as well. Kid also flies for the sake of flying. Kid will jump off the top of perches, dive to the floor, and do barrel rolls. Kid will wait for us to walk across the floor, so he can dive bomb us and brush the top of our heads with his feet. And if one of the other parrots takes flight, Kid will fly down and chase the other bird. Kid Kadra loves to bathe, sitting on the shower rail and getting misted with a spray bottle. Kid loves to come into the bathroom when we shower, and begs us for baths, and would probably take a bath every day given the chance. If all else fails, on a hot summer day, Kid will sit in the water dish with his wings draped over the sides.